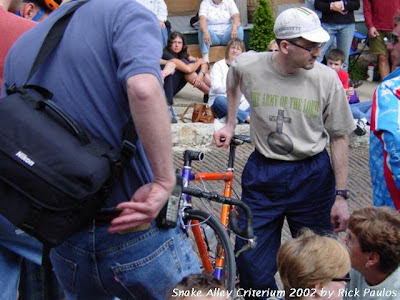 Another photo from Rick from the 2002 Snake Alley Criterium in Burlington, Iowa. The Army of the Lord did not help this stem. This photo proves that cell phones had made their way to iowa by at least 2002. "now I have the perfect excuse." --To me, this was an all time snake alley classic quote. I wouldn't get to snarky on this one, I've ridden in that race - Snake Alley is *actually* considered to be the "twistiest" street in the country. And it has cobbles. And the course takes it uphill. The only guy I know that's won that Crit more than once just signed with RadioShack. Where did you get snarky from my post? The rider to whom I am referring is one of my best friends. He said it as a joke. That's why I said it was a classic quote. Yes, I've done the race several times. It's hard as hell. It's a lot more fun to drink beer and watch! yea army of allah probably would have done the trick. why the comment? That cell phone is on a tourist, not an Iowan. roadpig: Read the T-shirt of the guy toting the bike. billy reid: I took the photo with a digital camera I bought in the year 2000, not a smart phone. Even Apple didn't have iphones in 2002.